Lauren Bowker’s beautiful PHNX fashion pieces transform from one color to the next, in reaction to the climate around them. Using thermochromatic ink, the designer infused delicate feathers to create the dazzling color changing effect. As variables like heat, light and friction change surrounding the garment, the flowing feathers morph from deep to bright hues, which also absorb air pollution. Bowker’s thermochromatic inks, called PdCl2, can be applied to any fabric, either by painting, screen printing, dying or embedding the dye within the fibers. She chose to use feathers for the PHNX for their delicacy and fragile beauty, and to showcase the inks’ capabilities in a sculptural form. She has also applied the inks to other more practical materials and fabrics, like upholstery and tshirt fabrics. PdCl2 changes color based on the slightest variables in the environment. Bowker has learned to harness its capabilities to showcase different colors from the environment in one area of town to another, by taking data from different points and creating ink to respond to the specific environments. Bowker hopes to expand the ink from being environmental signals and into the health industry. The designer is currently working on inks that could applied to t-shirts, that would change color during medical emergencies, indicating to the world if you were having an asthma attack or cardiac arrest. Lauren Bowker�s beautiful PHNX fashion pieces transform from one color to the next, in reaction to the climate around them.� Using thermochromatic ink, the designer infused delicate feathers to create the dazzling color changing effect. 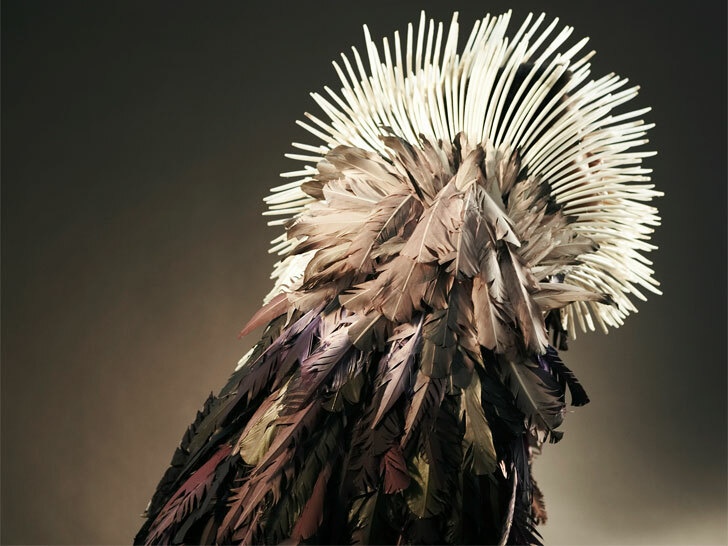 As variables like heat, light and friction change surrounding the garment, the flowing feathers morph from deep to bright hues, which also absorb air pollution.